Futures for the Dow Jones Industrial Average today (Wednesday) were flat – forecasting a meager 4-point gain – as the markets prepare for the U.S. Federal Reserve's two-day summit on monetary policy. Last night, the chief economist of Goldman Sachs Group Inc. (NYSE: GS) raised concerns about the markets due to a lack of consensus over the Federal Reserve's views on monetary policy. Jan Hatzius predicted the central bank will not raise interest rates until December. But don't underestimate the stupidity of the Federal Reserve, says Money Morning Chief Investment Strategist Keith Fitz-Gerald. In an interview with FOX Business this week, Keith explained that the Fed has missed every major economic event over the last seven years, and they might just misjudge the markets and the economy again this week. Watch the interview right here. Yesterday, the Dow Jones surged more than 228 points ahead of today's Federal Open Market Committee (FOMC) meeting. Markets seemed unaffected by weaker than expected monthly retail sales or a decline in industrial output during August. 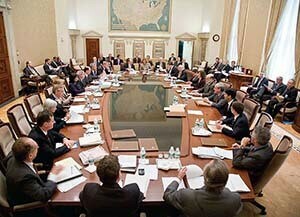 The Stock Market Today: The Fed Open Market Committee kicks off its two-day meeting to discuss monetary policy. In addition, investors will keep an eye on the monthly consumer price index, the housing market index, and the EIA Petroleum Status Report. Here's a breakdown of what to expect from the central bank's two-day assembly on Wednesday and Thursday (Sept. 16-17). Republican Debate: The 2016 political campaign is heating up, and CNN will broadcast the second GOP debate this evening. Many anticipate some heated exchanges between frontrunner Donald Trump and former Hewlett Packard CEO Carly Fiorina, who has seen some added support after her strong performance during the first round of debates. Money Morning has established full coverage of the 2016 campaigns, including updates on what everyone is talking about in a short, easy-to-read primer. You can check it out right here. Oil Outlook: Oil prices were rising this morning as traders anticipate that U.S. inventories and production are set to decline this week. WTI prices were up roughly 1.3% to reach $45.17. Meanwhile, Brent oil prices added 1.1% to $48.24 per barrel. Go here for a breakdown on how oil prices in 2015 could be affected by this week's Fed meeting. Earnings Reports: Companies reporting earnings include Oracle Corp. (NYSE: ORCL), FedEx Corp. (NYSE: FDX), Cracker Barrel Old Country Store Inc. (Nasdaq: CBRL), and Ascena Retail Group Inc. (NYSE: ASNA). Pre-Market Movers No. 1, HPQ: Shares of Hewlett-Packard Co. (NYSE: HPQ) were flat this morning on news the tech giant will slash 25,000 to 30,000 jobs as part of its restructuring and cost-saving program. The company is currently splitting its PC and printer division and is expected to reduce yearly costs by $2.7 billion. The stock is down 25% this morning. Pre-Market Movers No. 2, MSFT: Shares of Microsoft Corp. (Nasdaq: MSFT) were trading higher this morning after the company's board of directors announced a plan to hike its dividend by 16%. The firm announced the $0.05 increase will be payable to shareholders of record as of Nov. 19 on Dec. 10. MSFT stock was up 0.5% today. Pre-Market Movers No. 3, STRZA: Shares of Starz (Nasdaq: STRZA) surged nearly 7% after Bloomberg announced the company may be purchased by network owner AMC Networks Inc. (Nasdaq: AMCX). News of the deal also sent AMC shares up roughly 0.5%. Stocks to Watch No. 1, FB: Shares of Facebook Inc. (Nasdaq: FB) announced plans to allow its users to dislike posts or other information on the site. CEO Mark Zuckerberg announced plans for the button during a town hall event at the company's Menlo Park, Calif. headquarters. Shares were up more than 0.25% this morning. Stocks to Watch No. 2, FDX: Shipping giant FedEx Inc. (NYSE: FDX) announced earnings in the pre-market hours, and the report was not very good. The company reported adjusted quarterly per-share earnings of $2.42, which missed expectations of $2.46. The company missed on revenue expectations and issued a weaker outlook. Shares fell more than 4% on the news. The company raised eyebrows last evening after it announced plans to hike its shipping rates starting on Jan. 4, 2016. The company said rates for its express, ground, freight, and home-delivery services would jump by an average of 4.9%. The news is somewhat surprising given that shipping companies are enjoying lower oil prices. FedEx's earnings report is considered a proxy for the broader economy, raising concerns about financial conditions for the balance of the year. Stocks to Watch No. 3, BUD: Shares of Anheuser-Busch Inbev SA (NYSE ADR: BUD) were surging more than 6.5% this morning on news the Budweiser manufacturer is attempting to buy its largest rival, SABMiller Plc. (OTCMKTS ADR: SBMRY). The deal would combine the world's two largest brewing empires and give Inbev greater market share in emerging African and Asian economies.